The biggest ego in the history of the sport, the emperor of the NBA gets everything he ever wanted now: 15 months of farewells and bows; a tidy 30 years to fit onto his Hall of Fame plaque; and a chance to repair and repackage a legacy that NBA commissioner David Stern had slowly, surely lost the power to manipulate. For all the public proclamations, here's been the overwhelming league response to Stern's decision to leave the job on Feb. 1, 2014: a long, exasperated sigh, and a wish that his successor, Adam Silver, would be taking over sooner. Stern still has work to do; promoting the work of David Stern. Here comes his victory tour, the tender one-on-one sitdowns, the testimonials, basketball's favorite fable and bedtime story about how Stern made Magic and Bird in the 1980s, Jordan in the '90s, about how no one else ever would've landed big, fat television deals for people to watch them play basketball. Stern has been an excellent, opportunistic businessman. He did not inspire those under him, but ruled them with fear. He's shown a good heart, too, advocated social change for greater goods. Through it all, Stern reveled in the intimidation of league office employees, referees, general managers, coaches and players. Most thought that's why Stern would stay on the job forever, because he seemed to get such pleasure out of it. These 15 months aren't about Silver's transition into the commissioner's job, but Stern's elevation into the sport's almighty. Why now? After the world found out how Stern controls whose voice will be heard on his state-run television, he changed the conversation from people ridiculing his petty, self-centered management style to people exulting his vision. After controlling NBA executives and the most influential of opinion shapers for so long, the truth about Stern – his volcanic temper and bullying and vindictiveness, the preferential treatment for his personal pets, the processes and protocols pushed aside to mete out justice and injustice, the manipulations of franchise and player movement, the heavy-heavy handed involvement in officiating – finally had found its way into the NBA's reporting and records. Between now and his departure, Stern is determined to get a franchise back into Seattle, league sources said. He has become a strong ally of Microsoft CEO Steve Ballmer's group to bring back the NBA there. Ballmer's group has been trying to get the Maloof family to sell the Sacramento Kings, so that the franchise can eventually play in a new arena in Seattle. From the league office, pressure on the Maloofs to sell has been growing, sources said – just as hopes for a new Sacramento arena have been fading. Seattle Sonics fans will never forgive Stern for his complicit role in Clay Bennett's deception to move that franchise to Oklahoma City, but make no mistake: Stern desperately wants to return the NBA to one of its great markets and wants it for his own measure of vindication before he leaves office. As one source involved in the process said, "Stern has enough time to get a team back to Seattle, but he'll let Silver deal with the crowd [booing] on opening night." The propaganda machine out of Olympic Tower will go into overdrive to pitch Stern's narrative as the sport's historic marketer, the grower of the global game and the visionary responsible for turning the NBA's stars into the planet's most popular athletes. The league office has always fought so much harder to protect Stern's image than it did those of its players. Stan Van Gundy didn't get muscled out of a TV job because Stern feared he would be hard on the players. Stern has carefully cultivated Silver as his replacement, thrusting him onto the frontlines of the labor fight, the influential committees, and giving him the chance to get close with the power-broking younger owners to make sure Silver's ratification would come easily. Most of all, Stern made sure that the next commissioner owed him, owed his legacy, and that no outsider would ever come into Olympic Tower and unleash old secrets of how business had been done. For those wishing to talk out of school on Stern once he leaves office, they understand: Even if Stern can't hurt them anymore, Silver has his back. Most owners and executives support Silver's promotion and believe he has the ability to change the way the league office operates. As one high-ranking league office employee has told me, the owners want less centralized and more local power in the post-Stern era. Give Stern this: He was a force of nature, but his style – his belief that he could bully those inside the NBA, those in basketball federations around the world – is over. He knew it, and that makes it easier for him to go. The information age has made tyranny harder to manage across the globe, and that's true within Stern's NBA too. Over the summer, Stern consulted no one when he publicly raised the idea of changing Olympic basketball to an under-23 tournament, sources said. His underlings didn't know he would go public with it – FIBA, no one. He was David Stern, and he wanted to show the owners who wanted change that he could still sell a big idea on their behalf. "He misjudged it badly," one prominent international basketball official told Yahoo! Sports. "He didn't think about the consequences or the fallout. He still thought he could say something and it would get done." Stern dropped the fight fast, leaving Silver to take the grief of the owners who want an international basketball system where they control the NBA's great talent. Between now and Feb. 1, 2014, Stern's embarking on the longest victory lap in the history of professional sports, and he'll finally let Basketball Hall of Fame chairman Jerry Colangelo induct him. Stern runs that, too. Want to get into the Hall, Stern snaps his fingers and the committees vote the way he wants them to vote. 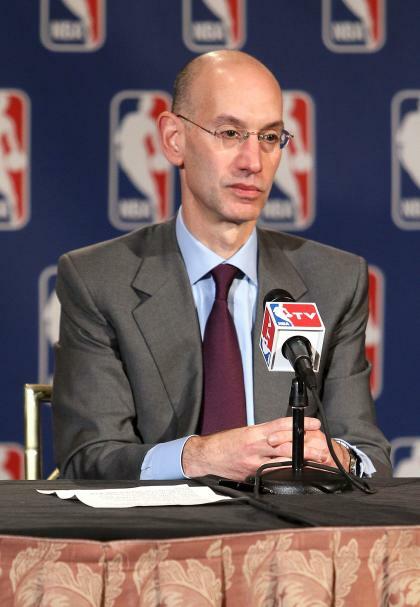 So here comes the emperor now, sleeping well in the understanding that the future of the NBA is secure because Adam Silver promises to make sure anything Stern doesn't want revealed about these past three decades of totalitarian rule comes out with a steep price and punishment to pay. 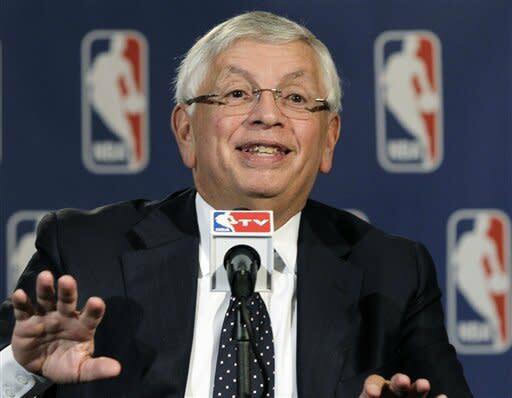 From the beach and someday the grave, Stern will have this league rigged for his legacy forever and ever. The fear and loathing of David Stern will never end, and perhaps that's what he's always wanted.